Try our delicious Cheesy Chicken & Rice Quesadillas made with Campbell's® Healthy Request® Condensed Cream of Chicken Soup. This appetizer is the perfect dish for any type of menu. whole wheat flour tortilla, 8-inch, frozen, thawed, 1.5 oz ea	 50 ea. 1. Place ½ of the tortillas on sheet pans that have been sprayed with nonstick cooking spray. cooked diced chicken, frozen, thawed	 50 oz. reduced fat Cheddar cheese, shredded	 13 oz. part skim mozzarella cheese, shredded	 13 oz. 2. 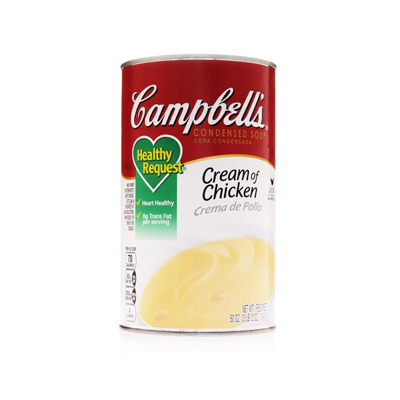 Combine chicken, cooked rice, cheeses, Campbells® Healthy Request® Condensed Cream of Chicken Soup, and first measure of Pace® Chunky Salsa together in a mixing bowl or pan. Mix well to evenly distribute all ingredients. 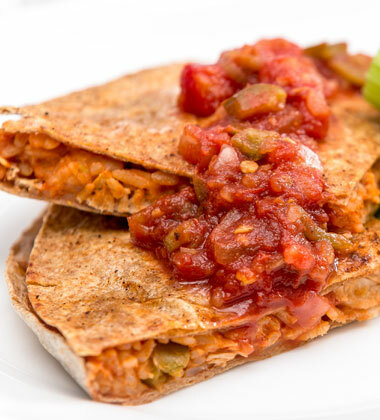 Use two level 6 oz spoodles to portion 1 ½ cups of the filling over each tortilla on the sheet pans. Use the back of the spoodle to evenly distribute the mixture over the surface of the tortilla to within ¼ of their edges and to evenly flatten the filling. Place one of the remaining prepared tortillas over each one of the topped tortillas on the sheet pans. Lightly brush the tops of each assembled quesadilla with the oil. Lightly sprinkle the garlic and chili powders over the oil. 4. Place pans in a 350°F oven until the cheese is melted and the quesadillas are lightly toasted (approximately 12 minutes). CCP: Heat until internal temperature reaches a minimum of 165°F for 15 seconds. 5. Use a #16 scoop to portion ¼ cup of salsa into individual portion cups. 6. Use a pizza cutter to cut each quesadilla into 4 equally sized pieces. Serve immediately. Portion size = 2 quesadilla pieces + 1 salsa dipping cup. CCP: Hold at hot at 140°F until served. whole wheat flour tortilla	 50 ea. cooked diced chicken	 50 oz. reduced fat Cheddar cheese	 12.5 oz. part skim mozzarella cheese	 12.5 oz. Thaw tortillas and chicken in the refrigerator in advance of preparation. If rice is prepared on the day of service, hold it hot at 140°F until quesadillas are assembled. If prepared in advance of the day of service, cool the rice in the refrigerator to 70°F within2 hours, and continue to cool to 40°F within an additional2 hours. Cooled rice can be used when assembling quesadillas. 1 lb + 12 oz long grain, parboiled brown rice will yield 3 qt + ½ cup cooked rice. 3 lb + 8 oz long grain, parboiled brown rice will yield 6 qt + 1 cup cooked rice. 1 lb + 9 oz long grain, regular brown rice will yield 3 qt + ½ cup cooked rice. 3 lb + 2 oz long grain, regular brown rice will yield 6 qt + 1 cup cooked rice. Batch cook for best quality.